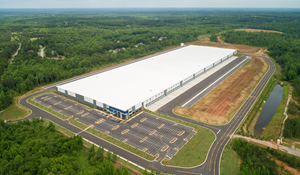 ATLANTA and NEWPORT BEACH, Calif., Dec. 20, 2018 (GLOBE NEWSWIRE) -- CT Realty and its affiliates have completed the first phase of development at Palmetto Logistics Park and announce a 1,054,500-square-foot lease to Drive DeVilbiss Healthcare, a global manufacturer of respiratory and ambulatory medical products that plans to take occupancy by the end of the year. Terms of the lease were not disclosed. CT is also nearing completion on 1.3 million square feet of large scale distribution buildings in the first phase of Interchange 55 Logistics Park in the greater Chicago area, and is in development on logistics centers in Indianapolis, Dallas/Fort Worth and New Jersey. The company’s current land holdings now support the development of roughly 24 million square feet of industrial buildings over the next five to seven years, and CT is actively seeking additional land holdings nationwide.